Hounslow hosted a visit by members of the Airports Commission yesterday, to assist them to understand the challenges involved in building a third runway at Heathrow. The Commission, led by Howard Davies, wanted to see first-hand the issues affecting residents, schools and companies around Heathrow. We started by visiting a residential road at the end of the runway to experience the effect of arriving aircraft flying overhead every minute. 70% of the time Heathrow is on westerly operation meaning the planes land over Hounslow but today they were on easterly operation so we took them to Poyle at the western end of the northern runway. The 747s registered 91dBa on the hand-held noise meter, and the others in the 80s, enough to wake up most people even where their homes have acoustic glazing and roof insulation. 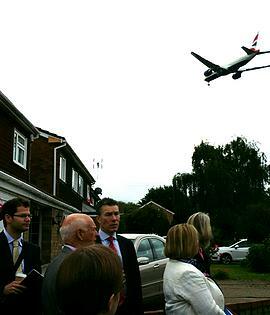 The tour went on to Alpha LSG in Heston, which provides meals for many of the major airlines flying out of Heathrow. They have invested in high technology plant and staff training with capacity to provide over 70,000 meals per day and are a very good example of the economic stimulus that Heathrow brings locally. On leaving LSG at about 8.30 am we experienced the down-side of growth, daily traffic congestion that delays their trucks getting meals to the planes on time, for which there is no easy solution. The final visit of the morning was to Beavers School in Hounslow west, which experiences severe noise problems irrespective of whether planes are landing or taking off. Filmed by BBC London News Head teacher Dee Scott described to Howard Davies, the Commission Chair, explaining how children’s learning is affected by the uneven waves of aircraft noise. She said many of her children are already disadvantaged by having their sleep disturbed as the last flight goes over at 11pm and the first morning flights wakes them just after at 4am. In the summer the teachers have to decide whether to open the windows to allow the class to be able to breath, or close them so they can be heard, which means the children practically suffocate. Heathrow airport is funding a pilot retrofit ventilation system in the school, but the technology is not yet functioning properly. As new classrooms are built to accommodate the growing population at Beavers, there is no funding from the airport to provide the acoustic insulation and ventilation needed for new buildings to comply with building regulations in such a noisy environment, which means limited capital funding is stretched further and other facilities have to be cut out. The morning tour illustrated to Commission members and their civil servants the experience of day-to-day life close to Heathrow. Built-up areas at the end of the runways, there before the airport opened, are experiencing ever more frequent flights, meaning disturbed sleep patterns and disrupted educations. The airport is a massive economic stimulant locally, and there is no shortage of jobs. These won’t be lost if a third runway doesn't go ahead, but the local economy would be severely threatened should a new airport be built east of London.